Brandin Cooks ran a 4.33-second 40-yard dash at his combine in 2014. This was the 15th-fastest 40 posted by a wide receiver at the combine this past decade. Throughout his career, Cooks has seen 90 targets against cornerbacks who posted a 40-yard dash of 4.44 or faster at their respective combines. He averages 1.65 PPR fantasy points per target against these “faster” cornerbacks. Cooks has seen 75 targets against cornerbacks that ran a 4.45 or slower 40 at their respective combines. He averages 2.91 fantasy points per target against these “slower” cornerbacks. Among 139 qualifying wide receivers to see at least 125 such targets over the past decade, that +1.26 fantasy-point-per-target differential is the largest of any wide receiver this past decade. In fact, it’s 0.69 fantasy points per target more than the next-closest wide receiver. I tested Harmon’s assertion that Cooks, throughout his career, has dominated on deep routes but has mostly underwhelmed everywhere else. Among all 51 receivers to record at least 250 targets over the past three seasons, Cooks ranks second-best in fantasy points per target (3.0) on deep routes (corner routes, post routes, and go routes). On all other routes, he ranks 20th-best (1.71.) 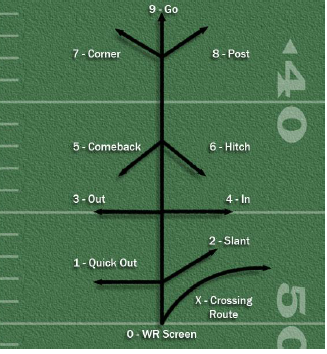 This was the second-greatest differential among all receivers. Of course, we’ve known for some time that Cooks’ bread and butter is the deep ball. Since he entered the league, 35 percent of Cooks’ fantasy points have come on deep targets (balls traveling 20 yards or more through the air.) 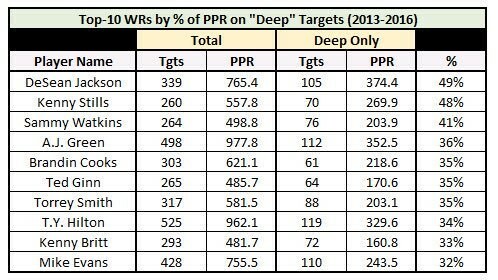 Among all wide receivers with at least 200 targets over that stretch, only four wide receivers have been more deep-target-dependent. “How will Bill Belichick use his new weapon?” I’m not entirely sure, but Belichick will probably treat Cooks no differently than the rest of his players. He’ll put Cooks in a position to do what he does best, and not ask him to do things he’s not very good at. Belichick was once quoted as saying (to his scouts), “Tell me what the guy can do, don’t tell me what he can’t do, and we’ll find a way to put that positive skill set in the defense and not ask him to be in a position where he can fail.” In this case, he’ll likely make sure Tom Brady peppers Cooks with targets on deep routes and against slower cornerbacks. The next question will be, “Turning 40 this offseason, does Tom Brady have the arm strength to make the most of Cooks’ deep-ball prowess?” To this question, I’d answer in the affirmative. If we include postseason performance, Brady’s 2016 season ranks second-best of the past decade in passer rating on deep passes (balls thrown 20 or more yards through the air), among all 206 quarterbacks with at least 50 such passes. Even at the age of 39, Brady still threw deep fairly often, on 12.2 percent of his throws — which ranked 12th-most of 27 qualifying passers. This number is even more impressive when considering no team trailed less frequently or led more frequently than the Patriots last season. For perspective, Drew Brees threw “deep” on only 9.8 percent of his passes, which ranked third-lowest — ahead of only Alex Smith and Sam Bradford. From a fantasy perspective, Cooks will likely continue to be a high-ceiling, low-floor boom-or-bust type of player. I’m not sure he necessarily supplants Julian Edelman in targets (146 in 2016) this year, but I also don’t think it’s unrealistic to suspect he sees a similar workload to what he saw in New Orleans last season (113 targets in 15 games). As far as efficiency is concerned, if you were going to leave New Orleans to join another team, it’s hard to do much better than New England. From a DFS perspective, the answer is simple. When Cooks is likely to be shadowed by – or run the majority of his routes against – a “slower” cornerback, it’s time to load up. Bonus Stat: Cooks also has underrated hands. Among all wide receivers to see at least 200 targets over the past five seasons, Cooks ranks fifth-best in drop rate.